Puff pastry is my entertaining secret weapon. It’s easy to work with, forgiving, and is equally useful in both sweet and savory applications. From palmiers to cheese sticks to napoleons, it’s very versatile. And because it’s so pretty when it bakes your guests will think you slaved in the kitchen for hours. And hey, who are you to correct that assumption? The next in my series of easy appetizers for a party uses my secret weapon and is inspired by a menu item at FINO, one of my favorite restaurants here in Austin. Their fried anchovy olives are delectable bites that I would eat endlessly if left to my own devices. In their application they batter olives and deep fry them to a lovely golden brown. I’m not a big fan of frying, particularly before a party, because the smell lingers and it can be messy. Instead, my version of their olive is wrapped in puff pastry and takes just a few minutes to put together. Pop these babies in the oven just before your guests arrive and serve them hot out of the oven for an impressive yet oh-so-simple nibble. Preheat the oven to 400 degrees and spray a baking sheet with non-stick spray. Place the puff pastry sheet on a floured counter and dust the top lightly with more flour. Roll the sheet into a 12 in. x 12 in. square. Using a ruler as a guide, cut the square into thirty six 2 in. x 2 in. squares. Place an olive in the center of each square with the tapered end of the olive pointing at one of the square’s corners. Bring two opposite corners of the pastry square together over the top of the olive and press them together lightly so they cover the top of the olive. Place the bundle on the baking sheet. Repeat with the remaining olives. Bake for 18-20 minutes or until the pastry is puffy and golden. The photo shows olives stuffed with almonds, but you can use any sort of stuffed olive you’d like. Blue cheese stuffed olives are classic while chipotle or anchovy stuffed olives have a bit of an unexpected flavor kick. You can even mix and match olives for some variety. While your olives will start the baking process neatly tucked between two of the corners of the raw puff pastry, as the pastry bakes it will puff (like it’s supposed to) and separate. Don’t worry, that’s what it’s supposed to do. You can prep these about an hour or so before you’re ready to bake them and store them on the baking sheet, loosely covered, in the refrigerator. I wouldn’t prep them much further in advance than an hour. 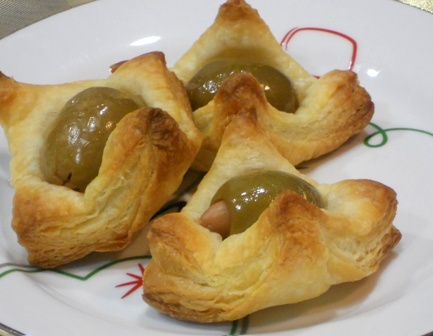 Even if you drain the olives well they’ll still be moist and may make the puff pastry soggy.